Besides being a valuable resource as fiber, cotton grows in warm places as an attractive ornamental plant. 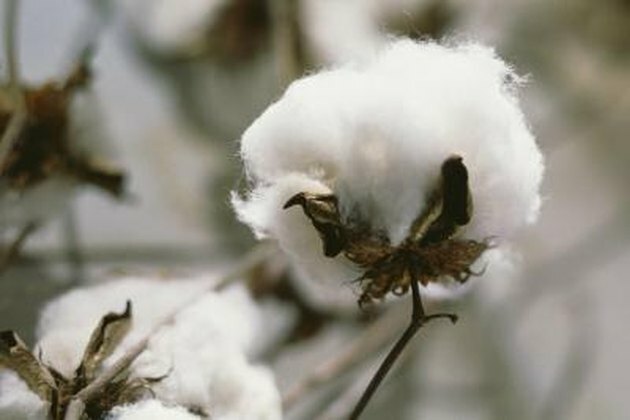 Cotton produces short-lived flowers that grow into hard-shelled bolls, protecting the soft cotton fibers inside. When the cotton is ripe, the bolls break open and the cotton is ready for picking. Removing the cotton seeds from the fiber can be a tedious task, but it's an easy one. Once the soil reaches 68 degrees F approximately two inches below the surface, you can plant the seeds after scarifying them, or soaking overnight, to have another seasonal patch of cotton in the yard. Ripe cotton bursts out of its protective bolls. Wait until the cotton bolls turn brown and open. Depending on your climate, it may take months for the fruit to mature. Remove the cotton bolls from the plant and place in a bowl or a bag. Pick out the loose cotton, watching for any sharp edges or stickers the boll may have. Each cotton boll has four segments, but the segments can produce more than four seeds. Put the loose cotton in another bowl or bag and dispose of the bolls. Use your fingers to remove the seed from the cotton and store the seeds in a container.